A successful management consultant working with corporations and executives to improve their bottom line, Kim entered the world of lung cancer when Roy, her 45-year-old husband, was diagnosed with stage IV lung cancer in 1997. They spent the next two years searching for hope. Roy underwent five different lung cancer research clinical trials from chemotherapy to immunotherapy to anti-angiogenesis therapies; he passed away in 1999. In order to address the disparity between funding for lung cancer and its impact on public health, Kim became a Lung SPORE (Specialized Program of Research Excellence) patient advocate at UCLA, where she met LCFA co-founders David Sturges and Lori Monroe. Kim has combined her skills as a successful consultant with those of a seasoned patient advocate with strong connections to the worlds of research and policy, to become a preeminent lung cancer advocate. In addition to her work as a SPORE advocate, Kim has served as a lung cancer patient advocate representative in various media, including broadcast, print, and social media. Kim continues to serve on the National Cancer Institute’s (NCI) Thoracic Malignancy Steering Committee (TMSC) and as Co-Chair of the Patient Advocacy Steering Committee. The TMSC functions to harmonize an efficient, cost-effective, science-driven, and transparent process that will identify and promote the “Best Science” in clinical research of lung and other thoracic malignancies by addressing the design and prioritization of phase III trials and large phase II studies in chest malignancies. Kim has also been appointed to the CAP/IASLC/AMP Lung Biomarkers Update Project Advisory Panel charged with drafting an evidence-based guideline on the Molecular Testing Guideline for Selection of Lung Cancer Patients and the ASCO Treatment of Small Cell Lung Cancer Clinical Practice Guideline Steering Committee. During her years as an advocate for lung cancer research and lung cancer patients, Kim has served on various committees and advisory bodies for organizations such as the International Association for the Study of Lung Cancer, American Association for Cancer Research, National Cancer Institute, College for American Pathologists, UCLA and various pharmaceutical and biotech companies. Kim’s work on behalf of lung cancer research has taken her to Capitol Hill to meet with such legislators as Edward Kennedy (D-MA), Jane Harmon (D-CA), Henry Waxman (D-CA), and Nancy Pelosi (D-CA), among others. 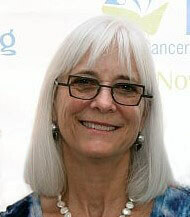 Her mission, along with LCFA, is to get lung cancer research the attention and funding it deserves. Kim lives in Los Angeles.